We can turn your designs into fabric!!! Just send as your design on a PDF file and we will do the rest. We are yet to find a fiber we cannot print on. Silk Screen printing technique is one of the most common textile printing techniques used in Indonesia. This process in most cases is a manual process with out the use of machines. A screen is developed with an image, this screen is then placed onto fabric, ink is pressed and swiped over the screen printing your fabric, this is done continually over your fabric to form your printed fabric. 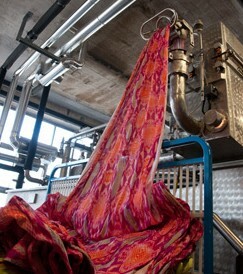 As apart of this process all fabrics are washed and rinsed to remove shrinkage. Silk screen printing has the advantage of smaller minims, you can divide the minim over a range of different fabrics. Digital yardage printing technique is one of the newest printing techniques for textile printing and has just been made available in Indonesia. It is very much like a giant inkjet printer. Not the cheapest option yet, However good value for small garments or parts of garments, still a quarter of the price of Australia. Rotary printing technique is common for larger orders, with medium to high minims. Fabric is feed through large cylinder rollers that have the yardage design printed onto them which then prints the fabric. We can turn your designs into placement prints to complete your garment!!! Just send as your design on a PDF file and will will do the rest. Silk Screen printing technique is one of the most common textile printing techniques used in Indonesia. This process in most cases is a manual process without the use of machines. A screen is developed with an image, this screen is then placed onto a garment or cut panel, manually ink is pressed and swiped over the screen printing your image onto the garment or cut panel. There are many effects you can achieve with silk screen placement printing such as having the print fluoro, glow in the dark, plastic, waterbased, bleach, flocked and many more. Mainly used on t-shirts. Digital placement printing technique is one of the newest printing techniques for textile printing and has just been made available in Indonesia. Digital printing as a placement print will produce photo quality prints that you can’t achieve using screen printing. It prints all colors at once like a ink jet printer. 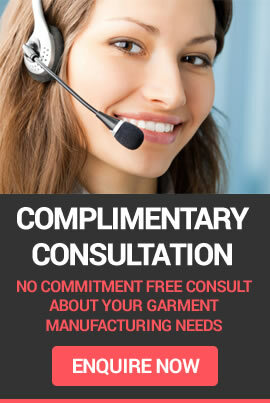 Contact our Melbourne Head Office on 1300 037 744 to discuss your garment manufacturing needs or feel free to enquire about a complimentary consult consult about what you would like achieve with your collection and range. What would like to achieve with your collection/range?